If you read (and hopefully enjoyed) my recent blogpost on The Rise Of The She Shed, you will know what a fan I am of interesting small workspaces. I am fortunate to live fairly near Shaw’s Corner, the National Trust’s country home of Irish playwright, George Bernard Shaw. He lived in the Edwardian villa for over 40 years from 1906; he was hugely prolific, writing nearly 60 plays, over 250,000 letters and untold numbers of articles and pamphlets. Today the property is open to the public and is well-tended by staff and volunteers. 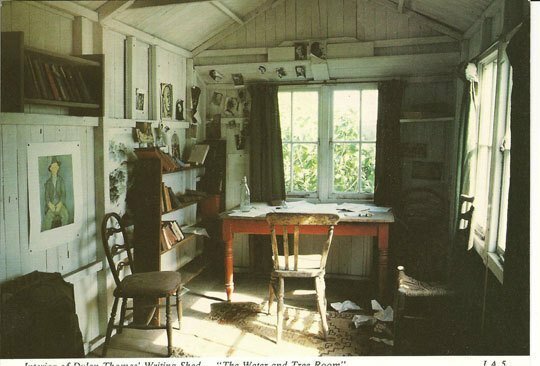 His writing hut at Shaw’s Corner (as the local villagers called the Rectory) in Ayot St Lawrence, Hertfordshire, was, and is today (after restoration) a remarkable spot indeed. The strange thing about his hut is that it spins. Mounted on a revolving mechanism, when finding himself writing in the shade, he simply put his shoulder into it and shifted it to chase the sun. 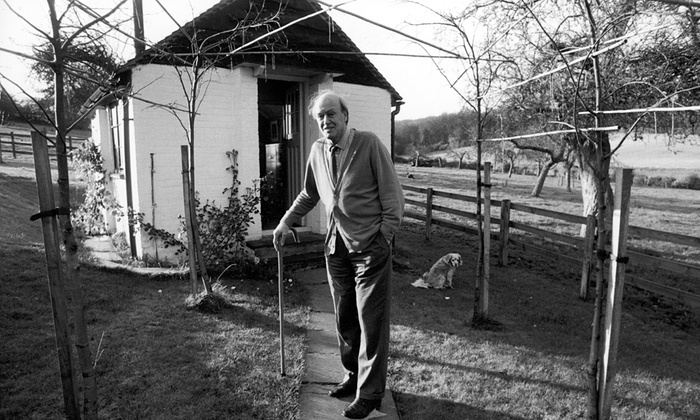 Shaw is known to have written many of his major works in his home-built revolving hut located at the bottom of his garden. So how did it work? The tiny structure was built on a central steel-pole frame with a circular track so that it could be rotated on its axis to follow the arc of the sun’s light during the day. Shaw dubbed the hut “London”, so that unwanted visitors could be told he was away “visiting the capital”. Ingenious. Today the garden is rather more heavily planted than when he was using it to top up on Vitamin D, but it is an enchanting spot nonetheless. He had a phone, desk, electricity and (I LOVE this bit) a bed!. I took these photos today and hope they give an idea of the charm of both the hut and the house and gardens. Sadly the house was closed for what turns out to be some major electrical renovations, but, while the grounds are small, they are most appealing. Information on visiting can be found here. Some further research on the hut and Shaw turned up some other photos and an article from 1929 detailing the health benefits of his revolving hut – plenty of Vitamin D. Funnily enough there was a recent report in the news here in the UK about the variable amount of Vitamin D us Brits can obtain from our often dodgy weather. 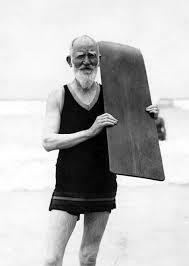 Public Health England says more than one in five people have low levels of vitamin D. Shaw, who by the way lived well into his 90s, was clearly well ahead of his time. 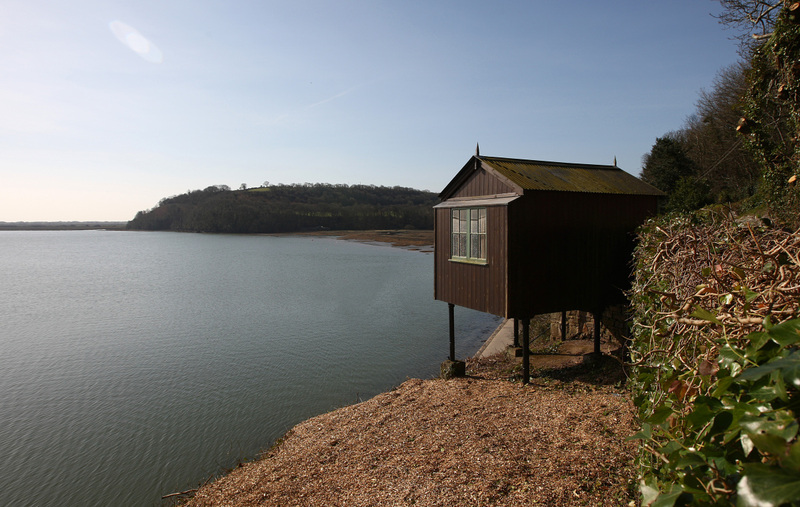 ……… and Dylan Thomas’s hut in Laugharne, Camarthenshire. There are more inspiring photos of sheds and writer’s huts: here. If you are lucky enough to have a hut where you work, I would love to hear about it. Well, the sun is out (we have had a dismal summer in my view) so I am off out to top up on some vitamin D myself.